Hey Guys! Hope your weekend is going great. I just wanted to share something with all my fellow bloggers out there. 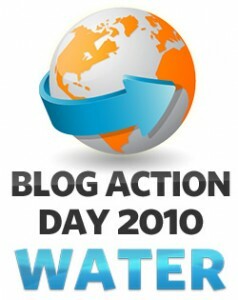 I recently learned about Blog Action Day through Chic Vegan and thought it was a great way for all us bloggers to come together on one day and help spread the word on a very important issue. This year's topic is water, so basically on October 15th, everyone does one post informing people of the scarcity of water and the effects it plays on our planet. Here is the official link with all the instructions. One last thing is Farm Sanctuary's Walk for Farm Animals. The walk is to help inform people about the treatment of animals on factory farms and to help raise money on abused animals. It's $15 to register and is going on right now across the country. They'll be coming my way next Sunday and I am planning to walk. So I'll have lots of pictures for you guys on how that went. For those who aren't aware of Farm Sanctuary, I encourage you to check out their site. They help to rescue hundreds of abused animals each year and I am very thankful that we have someone like them around. They take donations if you want to help with their recent rescues and currently they're allowing you to adopt a turkey ( virtually that is ) for as little as $30. There's no better way of celebrating the Thanksgiving holiday but to help save a life! Jacklyn thanks for the info about the water. I know you'll have a great day at the Farm Walk. We had a great turnout this year and I know next year will be even better.Looking forward to seeing your pic's! Excellent info. My students are doing a joint project with a group of kids in China revolving around water scarcity. This day will be right up there alley. Thanks for the information! I hope there are more people more aware of their water use. Great info! I had no idea there was a walk here in September, I wish I would have known! Great post! I will see if they are coming to my new area any time soon. I will definitely do this if that are!